New and ready to pair with the larger model of the mason jar warmer. Discover the wonder of childhood with Chasing Fireflies, now available as a Scentsy Nightlight. 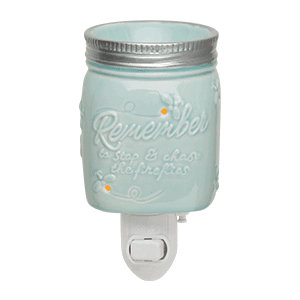 Capture the essence of carefree, playful summer evenings with this pale-blue warmer mimicking a miniature glass canning jar, complete with a silver ring and “filled” with fireflies.